For other uses, see Carbonate (disambiguation). 3. The name may also refer to a carbonate ester, an organic compound containing the carbonate group C(=O)(O–)2. The term is also used as a verb, to describe carbonation: the process of raising the concentrations of carbonate and bicarbonate ions in water to produce carbonated water and other carbonated beverages – either by the addition of carbon dioxide gas under pressure, or by dissolving carbonate or bicarbonate salts into the water. 3. Carbonate minerals are extremely varied and ubiquitous in chemically precipitated sedimentary rock. The most common are calcite or calcium carbonate, CaCO3, the chief constituent of limestone (as well as the main component of mollusc shells and coral skeletons); dolomite, a calcium-magnesium carbonate CaMg(CO3)2; and siderite, or iron(II) carbonate, FeCO3, an important iron ore. Sodium carbonate ("soda" or "natron") and potassium carbonate ("potash") have been used since antiquity for cleaning and preservation, as well as for the manufacture of glass. Carbonates are widely used in industry, e.g. in iron smelting, as a raw material for Portland cement and lime manufacture, in the composition of ceramic glazes, and more. The Lewis structure of the carbonate ion has two (long) single bonds to negative oxygen atoms, and one short double bond to a neutral oxygen. Metal carbonates generally decompose on heating, liberating carbon dioxide from the long term carbon cycle to the short term carbon cycle and leaving behind an oxide of the metal. This process is called calcination, after calx, the Latin name of quicklime or calcium oxide, CaO, which is obtained by roasting limestone in a lime kiln. Most carbonate salts are insoluble in water at standard temperature and pressure, with solubility constants of less than 1 × 10−8. Exceptions include lithium, sodium, potassium and ammonium carbonates, as well as many uranium carbonates. In aqueous solution, carbonate, bicarbonate, carbon dioxide, and carbonic acid exist together in a dynamic equilibrium. In strongly basic conditions, the carbonate ion predominates, while in weakly basic conditions, the bicarbonate ion is prevalent. 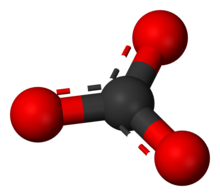 In more acid conditions, aqueous carbon dioxide, CO2(aq), is the main form, which, with water, H2O, is in equilibrium with carbonic acid – the equilibrium lies strongly towards carbon dioxide. Thus sodium carbonate is basic, sodium bicarbonate is weakly basic, while carbon dioxide itself is a weak acid. Although the carbonate salts of most metals are insoluble in water, the same is not true of the bicarbonate salts. In solution this equilibrium between carbonate, bicarbonate, carbon dioxide and carbonic acid changes constantly to the changing temperature and pressure conditions. In the case of metal ions with insoluble carbonates, e.g. CaCO3, formation of insoluble compounds results. This is an explanation for the buildup of scale inside pipes caused by hard water. In organic chemistry a carbonate can also refer to a functional group within a larger molecule that contains a carbon atom bound to three oxygen atoms, one of which is double bonded. These compounds are also known as organocarbonates or carbonate esters, and have the general formula ROCOOR′, or RR′CO3. Important organocarbonates include dimethyl carbonate, the cyclic compounds ethylene carbonate and propylene carbonate, and the phosgene replacement, triphosgene. It works as a buffer in the blood as follows: when pH is low, the concentration of hydrogen ions is too high, so one exhales CO2. This will cause the equation to shift left,[further explanation needed] essentially decreasing the concentration of H+ ions, causing a more basic pH. 3). This causes the equation to shift right, essentially increasing the concentration of hydrogen ions, causing a more acidic pH. 3) into urine as urea via the urea cycle (or Krebs–Henseleit ornithine cycle). By removing the bicarbonate, more H+ is generated from carbonic acid (H2CO3), which comes from CO2(g) produced by cellular respiration. 3 is on a geological scale and may all be redissolved into the sea and released to the atmosphere, increasing CO2 levels even more. It is generally thought that the presence of carbonates in rock is strong evidence for the presence of liquid water. Recent observations of the planetary nebula NGC 6302 show evidence for carbonates in space, where aqueous alteration similar to that on Earth is unlikely. Other minerals have been proposed which would fit the observations. Until recently carbonate deposits have not been found on Mars via remote sensing or in situ missions, even though Martian meteorites contain small amounts. Groundwater may have existed at both Gusev and Meridiani Planum. ^ a b c d International Union of Pure and Applied Chemistry (2005). Nomenclature of Inorganic Chemistry (IUPAC Recommendations 2005). Cambridge (UK): RSC–IUPAC. ISBN 0-85404-438-8. Electronic version. Chisholm, Hugh, ed. (1911). "Carbonates" . Encyclopædia Britannica (11th ed.). Cambridge University Press. ^ Kemper, F., Molster, F.J., Jager, C. and Waters, L.B.F.M. (2001) The mineral composition and spatial distribution of the dust ejecta of NGC 6302. Astronomy & Astrophysics 394, 679–690. ^ Squyres, S. W.; et al. (2007). "Pyroclastic Activity at Home Plate in Gusev Crater, Mars". Science. 316 (5825): 738–742. Bibcode:2007Sci...316..738S. doi:10.1126/science.1139045. PMID 17478719. ^ Squyres, S. W.; et al. (2006). "Overview of the Opportunity Mars Exploration Rover Mission to Meridiani Planum: Eagle Crater to Purgatory Ripple". Journal of Geophysical Research: Planets. 111 (E12): n/a. Bibcode:2006JGRE..11112S12S. doi:10.1029/2006JE002771. "Carbonate". Dictionary.com. Retrieved 5 April 2014.